A dental veneer is an artistically crafted, thin shell of porcelain that is bonded to the front surface of a tooth. Veneers allow dentists to change the shape, size, and color of teeth that may be broken, mal-positioned, badly discolored, or in need of improvement. When done correctly, veneers enhance a patient’s smile in a truly amazing way! To learn more about the artists at Haupt Lab who fabricate our veneers, visit their website at www.HauptLab.com. Here you will be able to meet the artists and browse some of their work! At your consultation appointment, one of our doctors will evaluate your smile with you. We encourage you to bring in pictures of smiles, or features of smiles, you find attractive. This consultation appointment allows us to communicate your desires with our lab artist, and also allows us to determine how many veneers you will require to achieve your goal. Sometimes, less is more! On the day of the tooth preparation, we will meticulously contour certain portions of your tooth to allow for a beautiful and strong result. This is a pain-free process done under local anesthesia. A digital model of your teeth will be created, which is ultimately what the lab uses to design your new smile. You will leave this appointment with temporary veneers hand-crafted by our dentist. You will then have the opportunity to utilize the temporary veneers as a “trial smile.” We invite you to ask friends and loved ones for their input regarding shape, size, and color. Once we fully understand your desires and your vision, the final porcelain veneers are made. At the delivery appointment, we will carefully bond the veneers to your teeth. This is a pain free process done under local anesthesia. It may take several days for your gums to heal around the new veneers, and the dentist will instruct you on how to best care for your new smile! Do I Need to Veneer All of my Teeth? Every patient has a unique situation, and we always attempt to develop a plan that requires as few teeth to be contoured as possible. 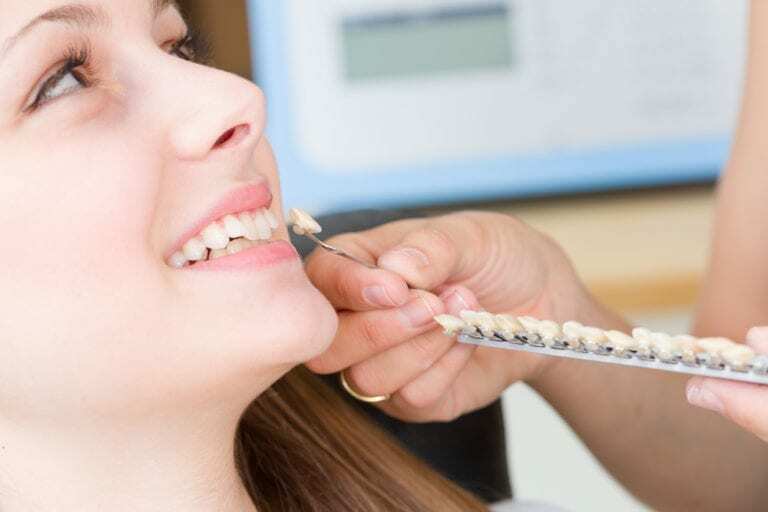 Many times, a combination of Invisalign and veneers allows the dentist and patient to achieve the desired result in a minimally invasive manner. If you would like to learn more about the Invisalign process, please see our Invisalign page!